Posted on March 16, 2016 at 10:53 am. Royal Vegas Casino asked players what prizes they wanted the most and the response was Las Vegas holidays. You asked and RVC listened, and now from the 1st to the 31st of March you can win one of three Las Vegas prize packages, along with instant win prizes just by playing real money casino games at Royal Vegas. 1. Login to your account at RoyalVegasCasino.com. 2. If you don’t have an account yet, follow our links to sign up and you’ll receive up to $1200 free in matched deposit bonuses, spread out over your first four deposits. 3. Make a deposit to your account and start playing games for real money. As you play, you’ll earn rewards points that will fill up the prize arrow – once you’ve reached 100% you’ll have unlocked a new scratch card. 4. Scratch the card to reveal the mystery instant prizes waiting underneath. 5. 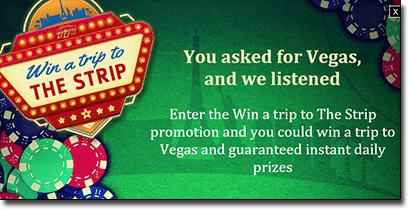 For every 100 reward points you earn, you’ll receive one ticket to the major prize draw to win the Las Vegas trip. Instant prizes consist of treats like free spins, free credits, boosted reward points, matched deposit bonuses and mystery prizes. Winners will be given the airfare money to book flights themselves, while the rest of the trip will be booked by the Royal Vegas team. The higher your loyalty tier is within the Royal Vegas rewards program, the bigger the prizes that will appear on your scratch cards. To update your status to the next loyalty tier, bring up your account details to check how many points are required for you to upgrade, and make a deposit to level up. With so many great Microgaming casino games available at Royal Vegas, you’ll have no issues finding entertaining games to play through in order to fill your prize arrow and receive the next scratch card. There’s been some new pokies added recently, including Bikini Party, Dragon Dance, SunTide, and Wild Orient, so this is a good chance to give these new titles a go. If you prefer the classics, Royal Vegas offer plenty of sophisticated table games, including several variations of roulette, blackjack, baccarat and poker. You have the choice of playing games in instant-play mode directly over your web browser, or by downloading Royal Vegas’s exclusive casino client – play using either method is eligible for this promotion. So for your chance to cruise the Vegas Strip in style, head to RoyalVegasCasino.com and start playing the wide range of casino games for real money, with deposits accepted in AUD using Visa, MasterCard, Paysafecard, Neteller, Skrill and more. Alternatively, we recommend Raging Bull Casino as our top-rated casino site for players from United States, which has some excellent welcome bonuses available for new players and offers hundreds of fun online casino games for instant-play.